When at a sushi restaurant recently with my family, we saw mochi ice cream on the menu and had to try a few. Both the azuki and green tea flavors tasted great, so when we saw the latter sold in a nearby asian grocer, we couldn’t help but pick up a box of six. When I pulled one from the package I had kept in the freezer, it was covered by a frosty ice coating. This isn’t too appealing in terms of taste of texture, but it it’s easy to wipe off with a wet towel, or by running it quickly under running water. This dessert consists of green tea ice cream wrapped in a very thin layer of Japanese-style ‘mochi’, made from sticky, glutinous rice. The stickiness and the creaminess really strike a perfect balance here. 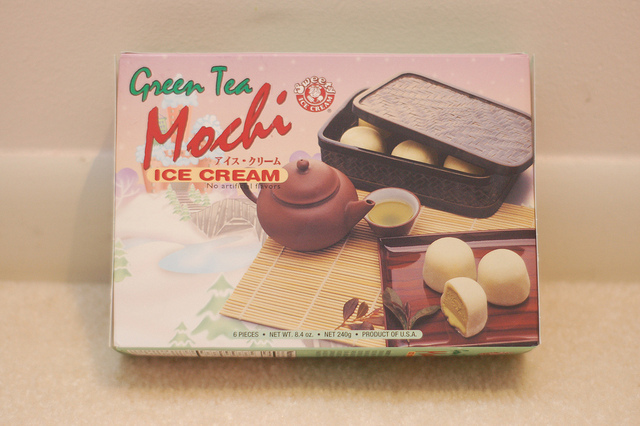 The ice cream is extremely sweet, with an equally strong flavor of authentic green tea. I find I get the most enjoyment when I cut this into little slices using a knife, and then pop them into my mouth one at a time to savor. It helps me to appreciate the bold sweetness without getting overloaded. All in all, great taste in a unique package. One serving is 2 pieces (80 grams), and has 180 calories with 2 grams of protein. A single serving also has 22 sugars. The sugar/weight ratio is pretty close to high-sugar ice creams such as some of the Talenti products, but the density is much higher here because all that sweetness is packed into a tiny ball. The ingredient list is pretty safe, with real green tea used in the flavoring and no artificial flavorings. The one exception is “mono & diglycerides”, which are used as emulsifying agents to extend shelf life and to help certain ingredients blend well together, such as oil & water. It is said that these contain fatty acids, which have had a lot of bad press lately because of their tendency to promote obesity and raise bad cholesterol. Ingredient list: ice cream mix (cream, milk, sugar, corn syrup solids, nonfat dry milk, locust bean gum, guar gum, mono & diglycerides, carrageenan), water, maltose, sugar, rice flour, green tea and pasteurized egg whites. I bought this at a local asian grocery store in South Florida for around $8.00. Though the packaging contains the words “ice cream” in Japanese script (アイス クリーム), the product is actually made within the USA by a company called “Sweet Novelty Inc” based in California. Though a little pricey, each of these frozen mochi balls is packed with a strikingly sweet green tea flavor inside a gummy mochi shell. I highly recommend it for green tea lovers, or anyone looking for a new way to experience ice cream.